Music has the power to inspire, heal and ignite change. 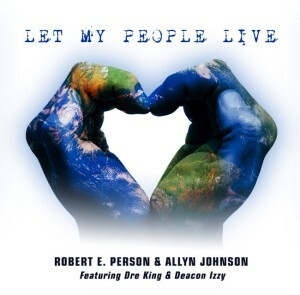 Singer Robert E. Person and pianist Allyn Johnson have penned “Let My People Live”, a collaborative musical statement promoting peace, unity and love amid the perils of today’s society. “Let My People Live”, available now on iTunes, Google Play and other digital music outlets, examines the recent social conditions of police brutality, heightened racial conflict and the many challenges of cultural acceptance. In acknowledgement of Black History Month and in personal conviction to encourage unity on a global scale, jazzmen Person and Johnson created this emotionally charged and intricately arranged anthem of awareness. They stylistically merged in trumpeter Dre King and sanctioned rapper Deacon Izzy to flow a poetic account of the growing tragic occurrences played out in the communities of the U.S. Although the many social situations that plague our world are difficult and sometimes seem hopeless, the message in “Let My People Live” is simple – “We all are human and deserve to be treated as such,” says Allyn Johnson. Applying and sharing this simple value can bring a wellspring of hope. Individually, each person must do their part to contribute positively to society and respect one another, and that starts from within. We must keep our hearts with all diligence, for out of the heart are the issues of life (Proverbs 4:23). Spread love and live! This entry was posted in Gospel and tagged Let My People Live, Robert E. Person by Kris Patrick. Bookmark the permalink.